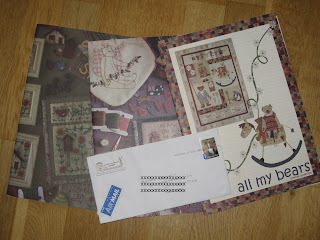 In early December I received a PIF gift from Inger. The fat envelope contained three giftrapped packets and a candy bag and lovely fabric Gingerbread Christmas card. And look what goodies Inger sent me! A nice fabric box with licorice and tea. A blue fabric shoppingbag. She also sent me the beautifull notebook. I simply love it. Thank you so much, Inger. In less than 12 hours 2008 will be history. I have made some plans for 2009 and will tell you all about it later. In the meantime I wish you all a Happy and Creative New Year. 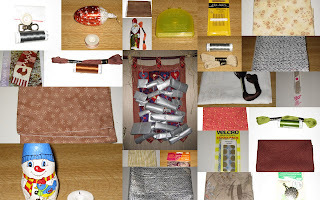 May the new year bring a lot of fabric and sewing happyness. Days are getting back to normal. DS1 and DIL left yesterday with Rex. As you can see Gizmo sure enjoy some peace and quiet in his house. The holidays have been a lot of fun, lot of visiting people, good foods and drinks. I got a bit tired myself yesterday. I ment to just relax on the couch with a good book. I ended up having a nap for several hours while DH was cooking. He is a darling, enjoying cooking so much. I promised to show the contents of those silver packets on my moms advent calendar. DIL showed me a small photo prosessing software and I made this collage of all the dayly gifts. I have not done any sewing since I finished last christmas presents. This is the bag I made for MIL for her to keep all her medicines and creams in. I also made this quilt for my niece Linnea. She is 15 months old and a darling princess. This is the center detail. Today I hope to finish block 10 of Nohas Ark BOM. I have several small stitcheries ready to be stitched. Among them a lovely Christmas Heart from May Britt. You find it here. The best part of Christmas holidays is visiters. In our house even the cat Gizmo get visiters for the holidays. Rex is DS1s cat. As you can see, Rex is feeling right at home in our house. Resting with our knitted "nisse"-family on Gizmos quilt. Cats also get presents for Christmas. This year I made to types of balls for both cats. The one with name on have a bag of Cat nip herbs inside. The other one have a ball with a bell inside. When Gizmo play with his cat nip ball he rubb and hug the ball. Rex is getting all worked up and is trying to kill his ball. So much fun to watch. Today is the day and everything is ready. The food is cooking and the smell of Christmas is spreading in the house. I just have to set the table. I wish you all a Merry Christmas. Take care and enjoy the holidays. 4th weekend Adventgifts from Hanne and May Britt. 3. weekend in Advent I got this cute notepad from May Britt and a lovely tin with pins from Hanne. 2. weekend Advent gift from May Britt and Hanne. Some weeks ago I received this award from May Britt, my very good friend. 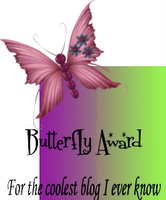 I'll pass it on to all bloggers who visit my blog today. 2. Link back to the givee. 4. Choose 10 blogs that I think are cool. Life have been hectic lately. So many gifts to make, packets to send, cookies to make, cleaning to do. It was not my intention to leave you out from the Advent fun. My camera memorycard is blocked (for ever I think) so I had to buy a new one. I love sharing photos with you. This is one lazy cat resting. For some reason he found my Advent tablerunner the best spot to lay down. Remember the Advent gifts in previous post? Last weekend I opend first gift from May Britt and Hanne. From May Britt I got some beautiful lime green buttons. 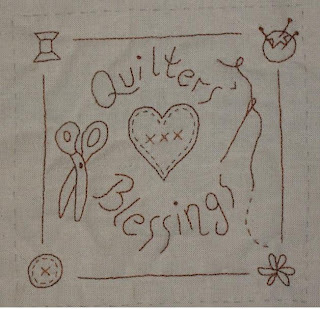 From Hanne a cute Tilda stitchery with thread. My camera is acting up on me! I am no great photographer and my camera is Canon Ixux 500 TI. For no reason I know of the memory card will not delever photos to my laptop, nor show photos on the camera. The display say memory card is locked. What is going on?? Anybody who can give me a clue? Lucky I had an old memory card laying around, but it's very limited. We had our Christmas meeting in our local quiltgroup on Wednesday. A lot of nice food, chat and , of cause, show and tell. I fiddled a lot to get my camera working so I just took a few photos. This is a beautifull soft colourd quilt one of the ladies had made for her daughter. I guess as a Cristmas present. This is a Christmas quilt made from red and green squares combined with redwork stitcheries. The quilt is a lot nicer in real life. Not all had made big quilts, Thank goodness! Anne had made this Christmas postcard. Very nice. Look at the quilting detales. Sue Daley and Willowberry Designs is having give aways. Hurry and go visit! Time to think about Christmas Gifts. This is some of the things I've made for somebody for Christmas. The Sofa Caddy is made from Helens pattern (Hugs'n Kisses). You can find a tutorial at my sidebar for how to make the hearts. I love the smell from the cinnamon stick on the hearts. Reminds me of making Christmas cookies. Stay in touch. There will be a give-away in November. This week end our local quiltgroup is having a ball. The exhibition is great. Our local quiltshop is there with a lot of fabric temptations. Also some of us is having crafts for sale. This is some of the things I have made for sale. Anita have more photos from the exhibition showing some of the beautifull quilts displayed. Visit her blog to se more. Look at my new bag. I bought it at Meretes blog to support Pink October. I love the bag the money goes to an absolutly good cause. This comming week end our local group, Lillesand og Grimstad Lappeklubb, is having a Quilt show. 15 years since we started our group. I have made a few more things for sale but need to put in a few more stitches before taking photos. It's a bit odd to invite you visiters from all over the world, but I really wish you could come.